This week we are thankful for our very talented Director of Creative Content, Luke Redd, who has officially been with Beelineweb for 8 years now! 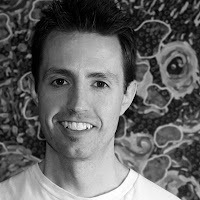 Luke was hired as our Director of Creative Content for his mad writing skills, and is responsible for a large portion of the writing on all of our web sites, including Beelineweb.com, Trade-Schools.net, Trade-Schools.ca, VocationalSchools.ca, GreatSeniorLiving.com, and more! Not only is Luke a word wizard, he also has his graphic design degree from The Art Institutes and has been responsible for most of the design work on our web sites, as well as all our branded material, such as our trade show booth and conference swag that many of our clients have. Thanks for sticking with us for 8 years, Luke, we are lucky to have you!